Climate City Expo takes place March 29 to April 7, 2019, organized by The Collider, a climate innovation center in Asheville, N.C.
(ASHEVILLE, N.C. — October 23, 2018): Business executives, entrepreneurs, climate scientists, and students from across the country will converge in Asheville this spring for Climate City Expo 2019, a conference that explores innovative climate solutions and business opportunities. Climate City Expo (CCx) 2019 is a project of The Collider, a nonprofit innovation center in Asheville, N.C. that empowers climate data entrepreneurs who help communities and economies become resilient to a changing climate. Held March 29 – April 7, CCx 2019 is a 10-day celebration of Asheville’s creativity and commitment to climate change awareness and action, featuring seven tracks of programming: Business, Next Generation, Luminaires, Arts, Eats, Learn, and Faith. The centerpiece is CCx: Business, held April 2-3, 2019, at The Collider. CCx: Business, formerly the Business of Climate Forum, is a cross-industry conference that convenes business executives, entrepreneurs, climate scientists, investors, and more to explore solutions at the leading edge of climate resilience. The speaker lineup will be announced in January 2019. 2018 conference speakers included leaders from IBM, Interface, Hewlett Packard Enterprise, Aon, VF Corporation, Levi Strauss Co., and organizations like Project Drawdown, NASA, and NOAA. For undergraduate students who want to participate in CCx, The Collider is hosting CCx: NextGen, a conference on April 1, 2019, where attendees will hear from leading climate professionals to gain exclusive insights into this growing field, explore climate resilience practices, and pitch their own solutions. The first luminary to confirm his presence at CCx is American science educator, engineer, comedian, television presenter, author, and inventor Bill Nye. 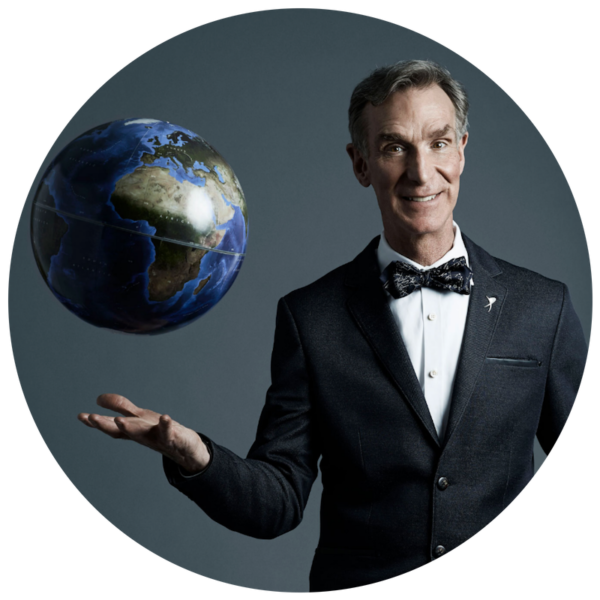 Bill Nye, and Greta Johnsen of WBEZ Chicago and host of the NERDette podcast, will dive deep into the science of climate change as evidenced by extreme weather onstage on Monday, April 1, 2019, at the Thomas Wolfe Auditorium. Tickets will be available for sale beginning Monday, October 29, at 10:00 am, at the U.S. Cellular Center Box Office, online at Ticketmaster.com, and by phone at 800-745-3000. Tickets for individuals registered for CCx: Business and CCx: NextGen will be available to purchase on October 23. Bill Nye is part of the CCx: Luminary track where the public will hear from visionary leaders who have made environmental action and a commitment to science lifelong callings. CCx features four tracks that are available to everyone and highlight the multitude of ways our city is rising to the challenge of climate change. Individual events and sessions run throughout the 10-day celebration. CCx: Arts: Experience works of art – across numerous mediums – that evoke deeply visceral experiences of our changing climate. CCx: Eats: Taste the best of Asheville’s culinary scene prepared by climate-conscious chefs, artisans, and brewers. CCx: Learn: Explore the dynamic relationships between climate change and communities through exhibits, talks, and activities. CCx: Faith: Engage with faith communities to explore connections among religion, spirituality, and climate change. Registration for CCx: Business and CCx: NextGen is now open. Early bird rates for CCx: Business extend through November 2, 2018. For more information, visit https://thecollider.org/climate-city-expo/. The Collider is an innovation and entrepreneurship center for market-based, data-driven climate solutions. We develop and train entrepreneurs who use climate and environmental data for breakthrough solutions that enable humanity to adapt to a changing climate. In addition, The Collider hosts industry and educational forums and cultivates young leaders by equipping them with the skills, knowledge, and perspectives to address climate change. More info on The Collider is available at thecollider.org. Follow The Collider on Facebook (@TheCollider01) and on Twitter (@TheCollider01), and Instagram (@TheCollider01).